One of the things that we needed to do as part of our cloud service journey was to be able to control disclosure of features. This was something we never had in the on-prem product. If I want to go to announce something at a conference, how do I allow the engineering team to go build it, test it, and deploy it, all without showing it to the whole world far ahead of the event? We have a couple conferences that we tend to target with new functionality, Build and Connect. Feature flags provide this kind of control. Flags also provide granular control all the way down to the individual user. I can make changes without a redeployment. When I make a change to a flag, the whole system knows about it. There are a set of notifications that go out. All the services react to it. It’s controlled by a PowerShell script or web UI. After a deployment’s done, we may go turn on a feature flag. That can all be fully automated or somebody can turn on a flag for a personal or customer account. My best example of using the granularity is SSH. When we rolled out SSH, we had a set of feature flags that controlled it. Not everybody wants to use SSH. We’ve got a standard process to turn feature flags on for sets of customers but sometimes you need to do something different for the feature because of the audience. In this case I literally wrote a blog post and said, “Hey, if you want SSH turned on, let me know.” Every time somebody sent me an email, I’d go turn the feature flag on. The whole purpose here is that we want to be able to do early experimentation. If you have seen some of our features very early on, when they’re still pretty rough, that’s because you’re in an early stage of feature flags. Getting this early feedback has been incredibly valuable to us. We can expose something very early on knowing that it’s not fully baked, get feedback, iterate without waiting until it’s all done and goes global. Sometimes it’s very helpful to be able to turn something off. Let’s say that you develop new features, behind a feature flag, you turn it on, something goes wrong. Whatever that thing is, you’ve got a quick way out. You can always turn it off and that turns out to be very valuable. When we use feature flags for architectural or infrastructural changes, flags let us test changes out incrementally and turn them off if something goes wrong at any point in time. To turn on feature flags, we have a standard rollout process that we use. We call it stages. Note that we have two separate concepts; rings and stages. Rings are for deployment, stages are for feature flags. Stages are all about disclosure or exposure. So, for example, our first stage is our team’s account (mseng) and our personal accounts. There’s a lot of stuff running on service right now that you don’t see because the only place flags are turned on is this first stage. That way our team can use it, go experiment with it. Select customers have opted into our second stage of feature flags. 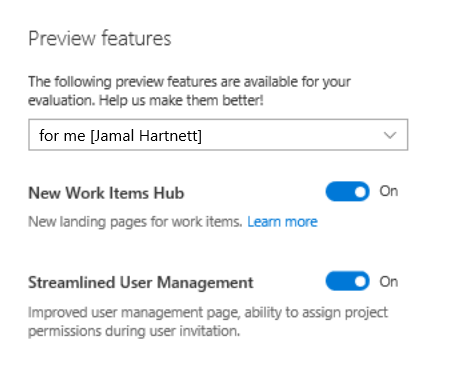 In the Azure DevOps web UI, there is a preview panel that you can get to from your avatar: click on your avatar and click on preview features. Those are all feature flags. But in the web UI, it doesn’t look that way. It just looks like a switch. For example, you want to turn on the new release editor and click the switch on. You actually just flipped a feature flag yourself. And then of course we can turn things on for every customer when we’re ready to roll it out globally. We have a great deal of control. I can control it from the individual user to global and everything in between. This flexibility has proven immensely valuable over time. Let’s take a look at a quick example. We added a couple buttons here Cherry-pick and Revert in the pull request UI. We did this about a year ago under feature flags, and it makes for a nice example. Let’s take the Revert button. How do we define a feature flag for that? We actually have an XML file that defines all the feature flags. There’s one file per service. That ensures that if a team ends up with their section getting really long, it’s clear it’s time to clean them up. They’ll delete old flags, because there’s a natural motivation to control the size of that file. In this group we should register TFS specific features and sets their states. Having a common server framework makes for a lot of reuse and economies of scale across the whole team. In order to use a feature flag, I just go add it to add it to an XML file. The rest of it is handled for me. I get the entire granularity, web UI, and PowerShell, all for free. I called my feature flag SourceControl.Revert. Here’s the actual Typescript from that page a year ago, and you can see that it calls the feature availability check. There are checks in both .NET and TypeScript, so you can use the flag either place. The code checks and says, “Hey, if this thing is enabled, then go put this button up there and on a button click call revert. If it’s not, then skip it.” And this one is particularly easy because the button is either there, or it’s not. This is all I had to do as an engineer to add this to my code. And so how do I control it? 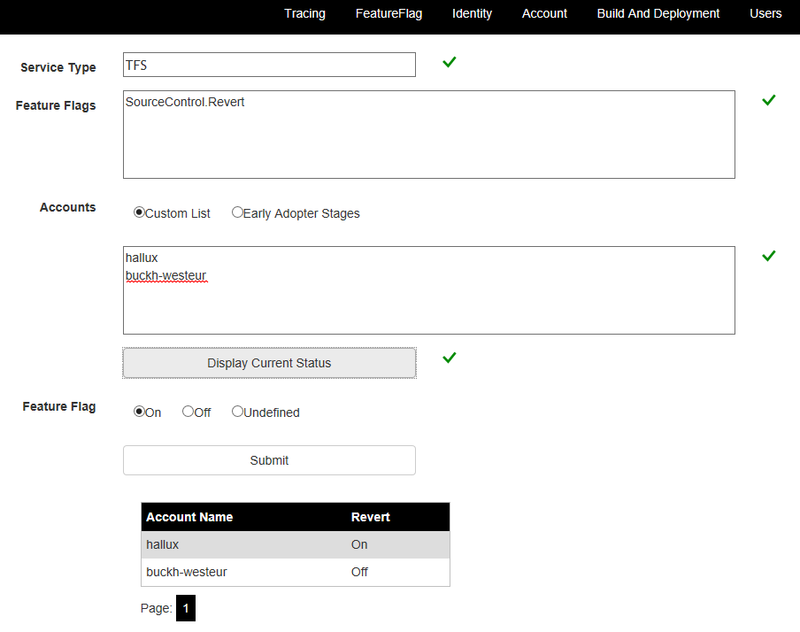 I mentioned earlier you can control it via PowerShell, and it’s as simple as you might expect: get feature flag, set feature flag, specify user account, etc., all defined on a wiki. It may also be part of your deployment. As part of your deployment, once a scale unit is upgraded, you make go turn on feature flags. It is a set of PowerShell calls that are part of that deployment, fully automated. Here’s an example of using the Web UI. Here I’ve got a feature flag for SourceControl.Revert. I’ve got two personal accounts listed here, hallux and buckh-westeur. And I’ve set the state to on for hallux, which happens to be in North Central, and I had it turned off for the account in West Europe. As I mentioned earlier with the SSH example, I emailed people. We also let people know in User Voice which notified people who had voted for it, “Hey we’ve got this feature now, send us email if you want to turn it on.” This web UI is how we turned on the SSH feature by request (we also didn’t have the preview panel in the product at the time). If you want to do something today, our recommendation is to have a look at LaunchDarkly, because they’ve built a whole service around this. They also have features we don’t have. Many feature flags go away and the teams themselves take care of that They decide when to go delete the feature flags. It can get unwieldy after a while, so there’s some natural motivation to go clean it up. It’s easy– you delete things. There are a set of feature flags that are persistent for more infrastructural things We tend to leave those flags in place. But there’s a downside to that. If you have two ways for your code to run and if you don’t test it both ways, it may not work when you go flip the flag in the opposite direction. So, if you’re going to keep the flag, you’ve got to make sure the code path continues to work. So there’s a tax to keeping it beyond just the code maintenance. By having things behind feature flags, I can have half-baked features in Master and not affect anybody else. As long as I’ve feature flagged it properly and turned the flag off, then I can have code in there and not affect other people. There are still other things you have to do, you have to think about things like security. Let’s say I add a REST endpoint. I either have to make sure it’s fully shut off, or I’ve thought about security for when it’s on. I don’t want to ship security holes. Feature flags are a key part to allowing us to work in Master. The other thing I tell people is that if there are certain destructive or disruptive changes you need to make, create a feature branch for a small amount of time. One of the more extreme examples is the transformation of going from a wide schema in work item tracking to a long one. In the wide schema approach, we created another column in the work item tracking SQL tables, every time you defined a new field. In making this change, they’re making some major changes to work item tracking, very destabilizing changes. They made the destabilizing changes in a branch and kept the “feature” behind a flag. My rule is such changes move up to Master as soon as they’re not causing any harm. We couldn’t do that without the ability to keep the unfinished feature hidden behind a feature flag. We started working in Master before we had our testing as good as it is today, and it was rough. (It was still much better than the old way.) There is some tax to it, and you have to test code both ways. However, the advantage you get of being able to have your code go out to production sooner and being able to iterate and experiment provides so much value that you’re willing to pay the price. And I don’t have to ask people to add features flags; they just do it, because there’s that much value to them. I absolutely recommend using feature flags. Munil Shah has a talk about not only having everybody work in master, but do it and do it well. We started before we really fixed our testing, and it was a bit miserable at times as the team grew quickly, but I would absolutely recommend it. The feature teams own the decision as to whether they need a feature flag or not for a given change. Not every change requires one, so if I choose to change some element on a web page or whatever, it’s a judgment call. But in the case of something like the revert feature I used as an example here, it was it was great to be able to have that behind a feature flag because that meant we could put the feature out in production with controlled exposure. Teams own their feature area. Aaron Bjork talks about autonomy, and this is part of enabling autonomy and quite honestly, I wouldn’t be able to know enough to give teams a better answer than they themselves could come up with. A common question is how we handle cleaning up the code after removing a feature flag. Since you add the feature flag to the XML file, it generates constants, including constants for C# and TypeScript. When you remove the flag from the XML file, there are no more constants in the generated output. If I delete a line of XML, the build regenerates the constants, and the deleted constants disappear so that at compile time I get an error if anything references them. As a result, it becomes a very clean way to take old feature flags out. The teams have to think through how they need to test. You need to test feature flags both ways. It’s up to the teams to make sure they’ve tested the combinations. They have to keep track of it. It’s not done centrally.